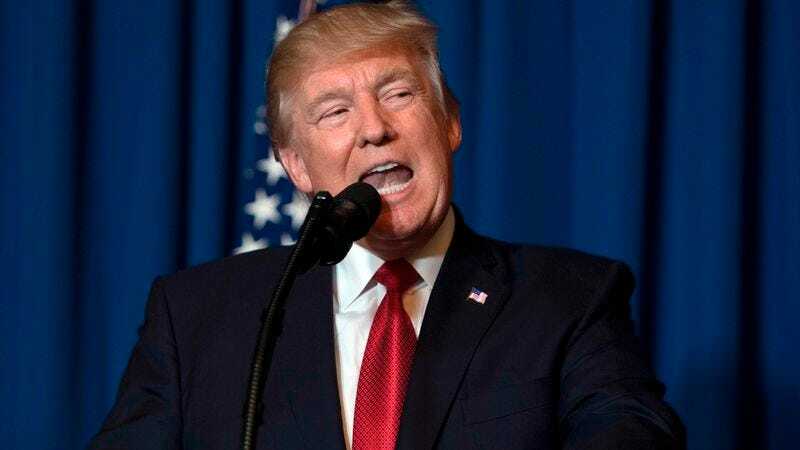 WASHINGTON—After ordering the first U.S. military attack against the regime of Syrian leader Bashar al-Assad, President Donald Trump held a press conference Friday to express his full confidence that the airstrike had completely wiped out the lingering Russian scandal. “Based on intelligence we have received over the past several hours, the attack on the al-Shayrat air base in Homs has successfully eliminated all discussions and allegations about my administration’s ties to the Russian government,” said Trump, adding that at approximately 4:40 a.m. local time, 59 Tomahawk cruise missiles fired from U.S. naval ships obliterated all traces of the widespread controversy in news outlets across the media. “Ordering this strike was not a decision I took lightly, but given that it was the only way to decisively eradicate any attention being paid to congressional investigations into possible collusion between key members of my staff and high-ranking Kremlin officials, I decided it was a necessary course of action. If we learn that any remnants of this scandal remain after this attack, I will not hesitate to order further strikes.” Trump went on to say that he is leaving the option open for a potential ground invasion of Syria if any troubling evidence emerges that the Russian government manipulated the outcome of the 2016 presidential election.